I like this pencil. All twenty-four pencils in the box were properly centred, an impressive quality level for such an inexpensive pencil. Fit and finish was adequate with no noticeable problems in the whole box. The yellow finish seemed smooth and remarkably consistent. The colour of the finish was a little more orange than bright yellow, which reminds me of the Camel Yellow colour of vintage race cars. I can’t say that they are the prettiest pencils, with their Camel Yellow finish, silver ferrule and pink eraser, but they are put together nicely without much flourish. The wood is unscented and generally quite white in colour. However, there were large discrepancies in the wood colour within the pencils as I examined the open box. Several of the pencils had one of the wood blank made out of a noticeably darker wood. This would be my largest criticism of the pencil, but as the wood sharpened perfectly in my Carl Angel 5 desk sharpener in the three pencils I tested this really is a minor concern. For such an inexpensive pencil, the quality control was remarkably good and I can honestly say I have had more problems with much more expensive pencils in the past. I put this pencil in a head to head test with arguably one of the best school designed pencils - the Tombow 2558 in HB. Both were freshly sharpened with the above mentioned Carl Angel 5. The Tombow is, as expected, buttery smooth. 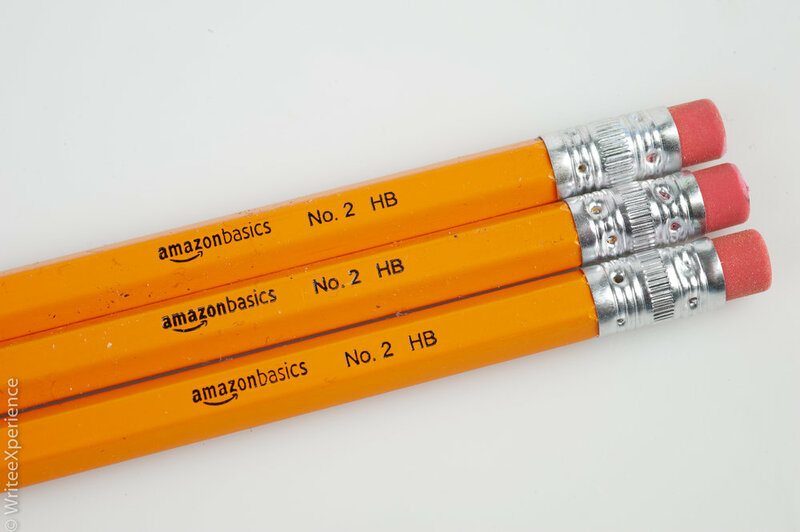 The Amazon Basics pencil has more feedback. But it wasn’t scratchy. I could feel more of the texture of the paper, but the feedback was steady and consistent. I didn’t find it unpleasant, and I did not feel and grittiness that one may get with less expensive pencils. The AmazonBasics wrote a slightly darker line than the Tombow, but it was very close. Point retention was very good and similar on both. Perhaps not to the German hardness, but with a good combination of smoothness, line darkness and hardness that I enjoyed from both. I could detect no smudging on either pencil, but that is not surprising with an HB graphite. The eraser on the Tombow was also slightly softer than the one on the Amazon Basics pencil, however both performed adequate in a quick eraser test. I am not a big fan of pencil tip erasers, but either of these worked adequately if needed. This is no Blackwing. Not a Tombow. Or Caran d’Ache. It’s a budget friendly, commodity pencil that will more likely be lost or thrown out before it makes a stub jar. It’s the kind of pencil that you will find tucked away in corporate supply closets across the land. An ubiquitous commodity and nothing special. It is not the type of pencil that gets talked about excitedly on social media, and is likely to be find with teeth marks and a blunt tip. Unloved would likely be a good word. But for all that, I like it. It is a very good and extremely functional pencil. One that you can leave on your desk without worry. One that you can stick on a clipboard or behind your ear. And at the low price, you can supply your children with extras to give to classmates. It does everything that a pencil is supposed to do. It writes and erases well and sharpens admirably. And with that simplicity, is a great every day utility pencil. At only $2.00 Canadian for 24 pencils, this is an excellent value. Compare to the Tombow that I tested it against at $10 for a dozen pencils, this yellow school pencil is well worth a look.